Elegant. Sophisticated. Built for the outdoors. Affordable. These are just some of the words that easily come to mind about the Invicta Women’s 15252 Pro Diver Watch. This attention to looks, function, outdoor wear, and appeal easily separates the 15252 from the competition. If you are looking for a watch that will make you look great in all sorts of indoor and outdoor settings but is priced in such a way that it won’t set you back, the 15252 offers a lot of value. Just like with other models, it isn’t for everybody. If you like a healthy dose of bling without going overboard, you need to take a look at this watch. Clad in 18k gold ion-plating, this watch is no slouch when it comes to luxury. After all, not only will the light gold color catch your attention, the thirty crystals decking out the face of this time piece are sure to hold your eyes captive. To top it all off the 12 and 6 on this watch’s face are formed by small crystals. As elegant as the 15252 may be, make no mistakes about it, this watch is built for outdoor endurance. Too many watch models are quite one-dimensional: they either focus on the ‘bling’ or luxury factor, their low price, or their outdoor versatility. In most cases, you can only pick two of these qualities. It would be wholly unrealistic for a watch fan to ask for all three. 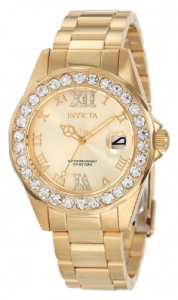 The good news is that the Invicta Women’s 15252 delivers all three in one nice-looking timepiece. Back when quartz watches came out, watch fans were quite wary of placing too much trust and confidence on quartz batteries to power up their watches. Eventually, quartz movement technology improved and quartz-powered watches began to hold their own against other watch movement types. However, it was only when Japanese Quartz technology entered the scene did quartz-driven watches fully bloom. Thanks to this great technology, a wide variety of watch brands were able to tap quartz power with a high degree of quality assurance. The 15252 is powered by Japanese quartz technology and this helps explain its lower price and dependability. Talk about the best of both worlds. Make no mistake about it, the Invicta Women’s 15252 is no joke when it comes to quality assurance. Not only can you safely and confidently swim with this time piece, you can even dive 660 feet down without any problems. If that isn’t awesome enough for you, the manufacturer of the Invicta 15252 is so confident of this product’s value that it comes with a 1 year warranty. The thing about value when it comes to watches is that you are often reduced to picking two of the following factors: looks, durability/outdoor versatility, and price. With other models you can only pick two. Thankfully, at $87.99 per unit, the 15252 doesn’t force you to make that voice. Now, that is real solid value.